A rare thing indeed … an image of Bear and I (taken by my husband) with our coach who, through the creative use of a shovel he usually uses to fix the footing, is showing me correct placement of my hands. It’s a heavy shovel. He got tired quickly. Still, he held it there long enough for me to get the point. Correct hand placement is an ongoing struggle but one I am determined to master. It’s obvious how much better Bear goes when I’m using my hands properly. Bear is off this week with a lameness issue in his left hind. The vet is coming today to check him out. Nothing serious, I dare say. It’s just that now he’s moving more correctly his weakness there is more pronounced since he can’t mask it by over-compensating somewhere else. We think it’s in his stifle area (the knee joint of the hind leg). I’ll let you know what we find out. We’re both weaker to the left. A lot of correction going on. More on the FEEL course soon. It’s difficult to write about while I’m learning so much. 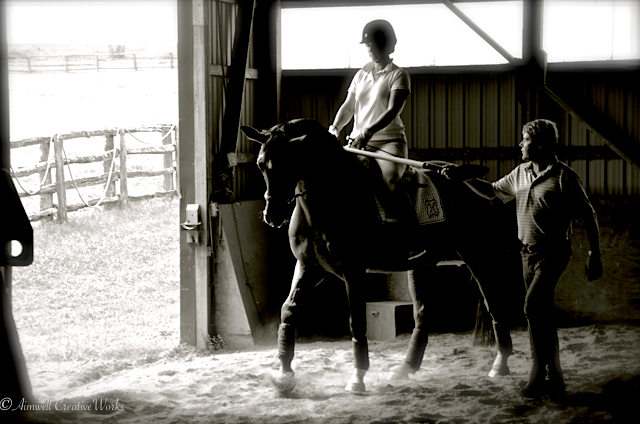 This entry was posted in Equestrian, Musings, Photography, Writing and tagged Aimwell CreativeWorks, Dorothy Chiotti, Equestrian, Healing, Horse, Horse mom, Nurturing, self-awareness, ShakespearesGal, teacher. Bookmark the permalink. isn’t life just so good when you nurture what you love. i am going to enjoy looking at your horse happenings too. i am just getting back to riding after a long break (about 15 years). it is just bliss to be back connecting with these beautiful animals.